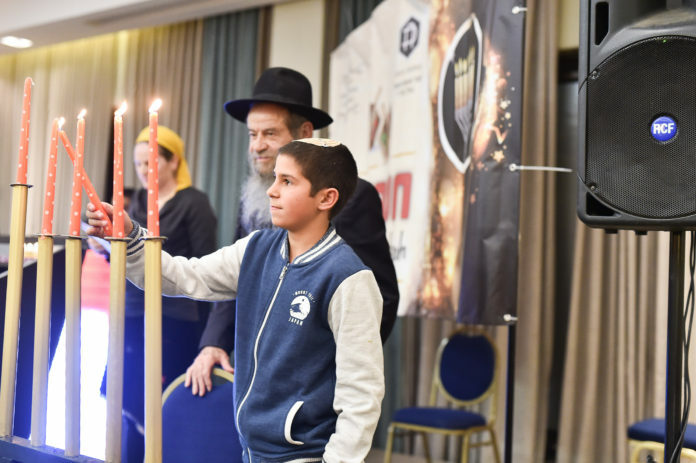 For two days over Chanuka in Jerusalem, some 100 families from all over Israel were given the chance to escape from the often-difficult realities of daily life. Each one of the families enjoying the holiday retreat organized by the Colel Chabad charitable organization had lost their fathers due to tragic loss- either sickness, a vehicle accident or in many cases a terror attack. The oldest and longest continuously running social services organization in Israel since 1788, Colel Chabad works in a variety of ways to help the families throughout the year. Providing food, clothing and social services for close to 300 widows and over 600 orphans annually, the program also includes tutors and social workers to help monitor the child’s education as well as providing career counseling, training and loans for the parent. The hotel guests were provided with round the clock entertainment – concerts and shows, drumming circles, day trips, art projects and swimming as well as gifts for the holiday. Now in it’s 12th year, the number of participants sadly grows each year, particularly with the addition of new families who have been affected by the tragedy in recent months.